This is it. This is the day that I have been waiting for since I arrived in Florida. I get to swim and play with a dolphin at Discovery Cove. YAY! Woohoo! 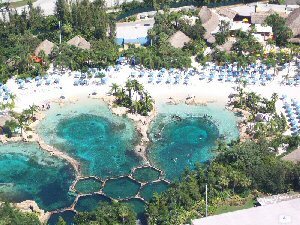 I arrived at Discovery Cove at 9:30am and was given a time and place for my swim, 12:45pm at the Starfish Cabana. 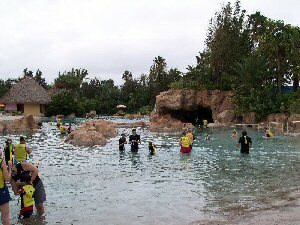 As you enter the park, you are given a snorkel kit and told where you can get a wetsuit. After picking one up I went to fresh water area. This is an area for people to swim in. Leading off this, there is a circuit that you can swim around. This was nice, and there was plenty to see under the water. After completing this, I went and saw the area where the dolphin swim takes place. There are 3 areas, each with 4 dolphins in them. I still had some time before my dolphin swim, so I went for a walk and found the salt water area. This was very nice. An area with many fish swimming around. On the very bottom, you could even see some Manta Rays swimming around too, at least 4 or 5 of them. Around 12:00pm there was a heavy downpour, but it didn't seem to affect everyone's fun, people just found some cover for 5 minutes. It was still raining when I headed to the Starfish Cabana for my Dolphin Swim. A brief thunderstorm started, and we were delayed for 15 minutes. The rain had stopped by the time we headed out. We finally get to go out there, I was in a group of about 8 people. First up we get to touch the dolphin, whilst the trainers are telling us facts about them, and answered any questions that anyone had. Next up everyone gets to give Hutch (our dolphins name) a kiss, possibly my favourite part. 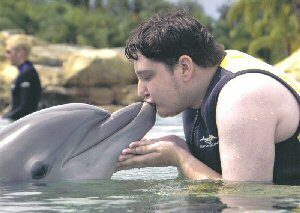 Kissing a dolphin is lovely, they are so friendly. Afterwards, I was told to tap Hutch on the top of his head, which I did and he made a naughty noise, which he blamed on me. Fun. After some more tricks, lots of info and more touching, we get to have a ride from Hutch. I go out to the center of the pool, and when Hutch arrives I am shown how to hold onto his fin and tail, which I do, and it's off! A slow but wonderful ride back to the edge. After I got off, I was given some food to feed to Hutch. After everyone had had their ride, we were told some more about them and shown a few more tricks. 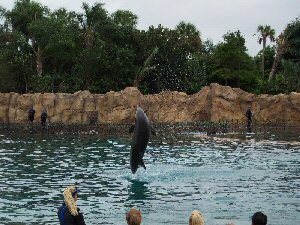 Then the four dolphins swam out to the center and did some jumping and tricks. Hutch came back, gave a wave, and it was time for us to leave the pool. Time for some food, which was included in the entrance fee. I went for the big burger with chips, some strawberries, and a tropical punch. Very nice food too. I had another walk round and took some photos of the dolphins. I went for another swim in the fresh water area again before deciding to start getting ready to leave. After getting freshened up, I had a little walk round and went to pick up the photos that were taken during my dolphin swim. I had chosen 4 photos and decided to get the video that was made too. I left discovery Cove around 4:30pm. This was another amazing day out, and one that I will not forget in a long time. Swimming and playing with a dolphin is beyond words to describe, it is one thing that you really should do in your lifetime. The photos I picked up are great. Some amazing shots of me with Hutch. This is easily the best day of my holiday here in Orlando.